Gray seems to be taking over beige everywhere in home decor and design these days. If you are like a lot of people, you have beige toned pieces that you still want to (or HAVE to) incorporate into your home. 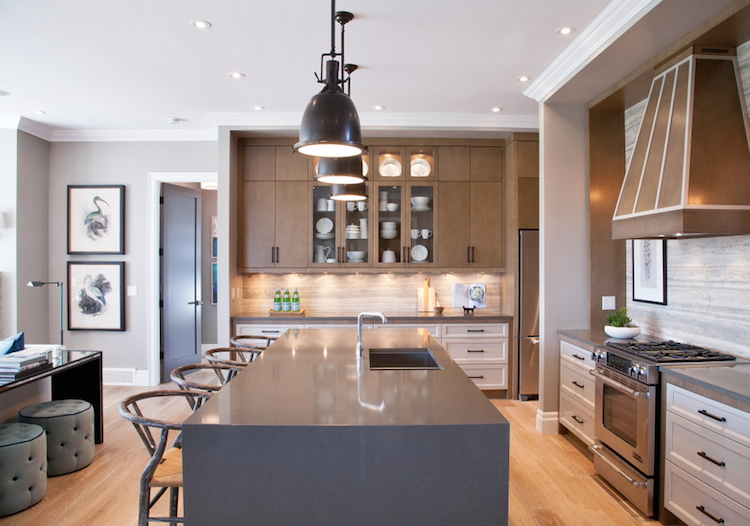 Kitchen renovations can get expensive so most of us can get stuck with finishes we don’t necessarily LOVE. But, there are ways to mix in shades that can help create a look that you want to achieve. I recently started a “Design Advice” column where YOU can ask me anything. I love helping my readers so please send questions my way and I’ll be answering them through a blog post! 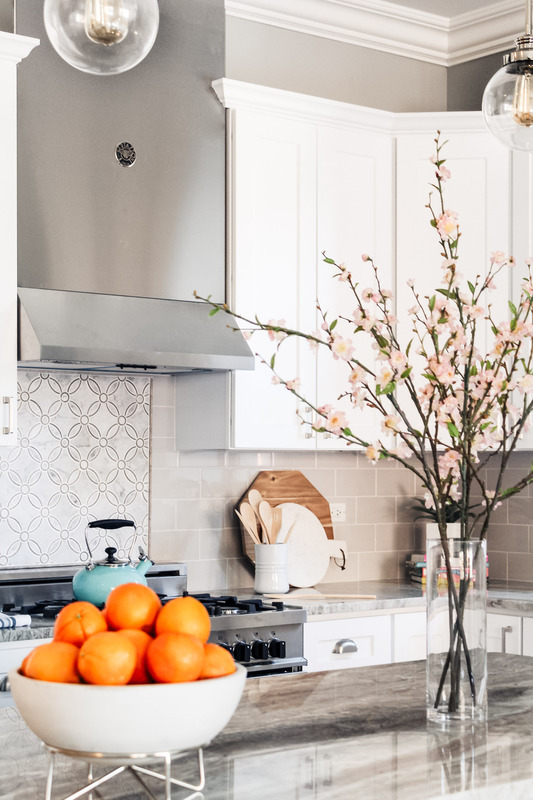 The first question I received after announcing the “Design Advice” column, was from Michelle who asked “Can you mix beige and gray in the kitchen?” These are both neutrals, however, it can be tricky to mix them. I’ll share a couple tips and inspirational images to do it right. There are a couple things to consider and one of the most important are the undertones. Just remember, mix cool tones with cool tones and warm with warm. And one of the easiest ways to give a kitchen a new look is through a fresh coat of paint. But which color will work best for mixing gray and beige together? One word…GREIGE. In case you aren’t familiar, greige is a term for the color of essentially mixing beige and gray. Incorporating greige in your space will help tie your beige and gray pieces together. I’m putting together my favorite list of greige paint colors so be sure to subscribe to Shining on Design to get notified!! Michelle has a warm beige backsplash in her kitchen but she wants the kitchen walls to be painted gray. My advice to her was to choose a greige or a warm gray. Painting walls have a big impact but it can make a HUGE difference if you have the luxury of painting the cabinets as well. 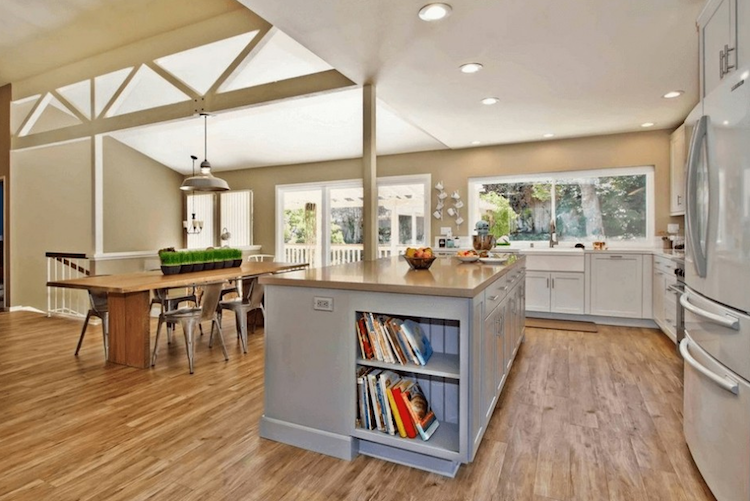 Or just the kitchen island can make a big impact too (shown above). Another way to mix beige and gray tones are with accent pieces. When it comes to the kitchen, a perfect accent update is through the backsplash. Think metallics, woods and textures to marry these neutrals in a space. In the photo above, the metallics in the backsplash also mix in beige tones to tie together the gray counters and maple cabinets. 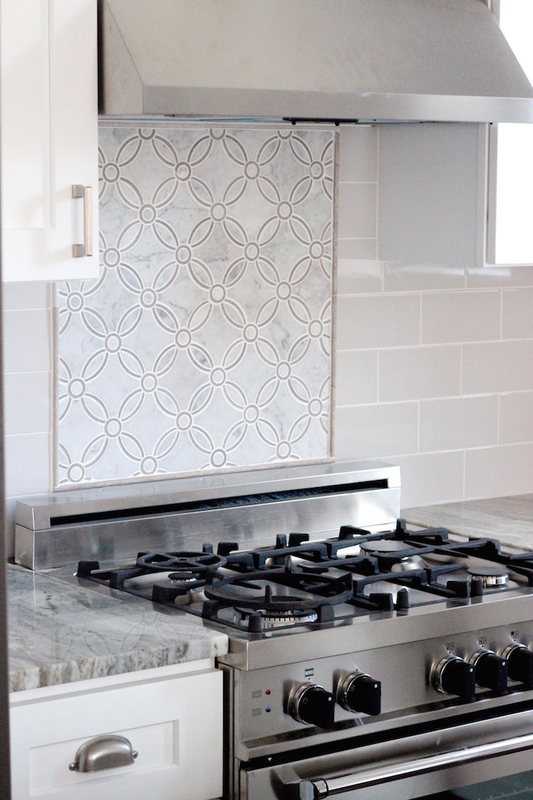 And this gray and white marble backsplash with creme cabinets – beautiful! 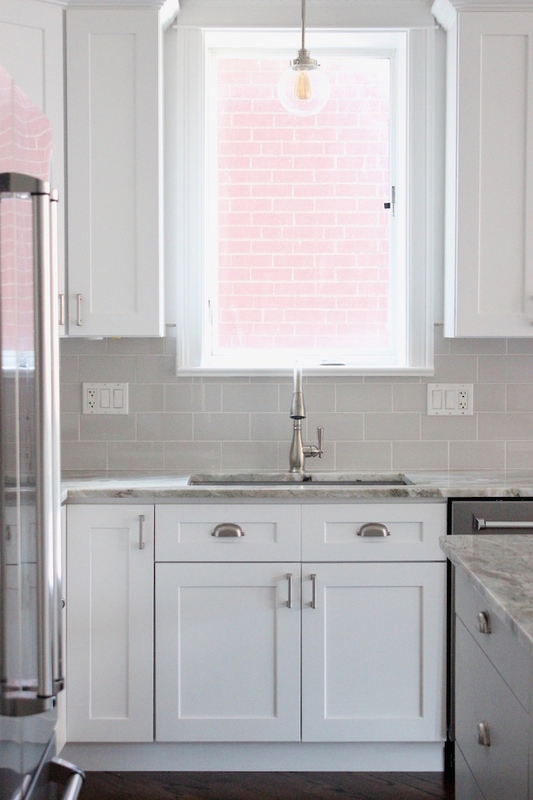 I share one of my all time favorite kitchen backsplashes in this post: Project Reveal: New Construction Project in Elmhurst. It is PERFECT for a kitchen where you are mixing grey and beige! I recently completed a project where we kept some of the existing beige tile in the bathrooms. To give the condo a cohesive look, I incorporated beige (and light greige) tones in the kitchen with the countertops and accent tile. 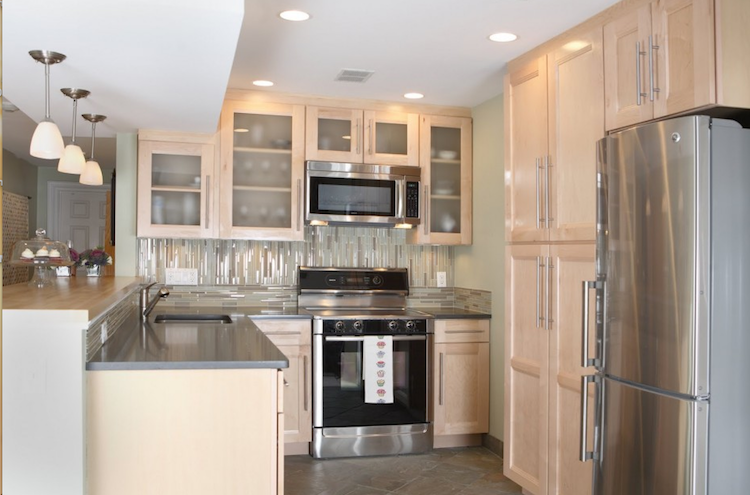 We painted the island gray to match the wall color and went with solid white cabinets. The countertop has both gray and beige tones throughout. (I was thrilled to find this perfect slab by the way and had almost had to fight for it!). Do you have a design question that you would like help with? Ask me and I’ll be sharing another answer next month! Thanks for stopping by and enjoy the rest of your week! Do I Need A Dining Room Rug? Where can I find that greige accent tile? It is beautiful! It’s from The Tile Shop. One of my favorites! Hello! Hoping you might be able to provide help to some first-time home owners. Our whole house is beige-ish- It’s a custom Sherwin Williams paint but I tried to match it as close as I could (Champagne SW 6644) When we bought the house, we knew that something needed to be done with the kitchen, specifically the cabinets. We came to find that they had this white plastic material that kept peeling off. Because the first floor is very open, we can’t really change the color of the kitchen. So we want to bring some color to our cabinets and cabinet frames. Do you have any recommendations? I initially wanted grey but I’m worried it won’t match with the current color of the walls. My other option is a darker blue-grey color. Again, our whole house is beige so I don’t want to pick something that will look off. I’d like to do something with our bathrooms and master bedroom, but that’s down the line! I am remodeling my kitchen with white cabinets and new floor which butts up next to hardwood in the living and dining rooms, which has brown reddish brown overtones. I want to incorporate greys or greige. I am replacing all the ceramic floor tile. I would like to put in the porcelain type “hardwood” in possibly a grey or charcoal grey. What would you suggest? The wall colors in the hallways and other rooms are in the beige family. What wall color would you suggest for the kitchen? Thank you!